We have been incredibly lucky. Despite living in a veritable forest, we don't seem to have lost any trees. There are branches, leaves, and other debris everywhere, but a walk through the neighborhood showed no significant damage. The neighbors we ran into were equally pleased and puzzled. Spot the deer! 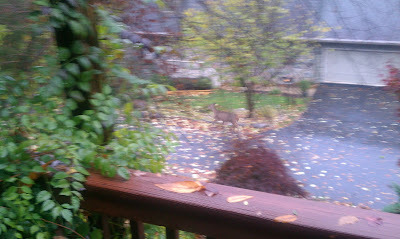 She was herding her two kids up the street this morning. We've watched the babies grow up all summer, so I'm glad to see they made it through the storm. I know many people, especially to the north and east, didn't fare so well. Our thoughts are with you as you rebuild, recover, and get back to normal. Hopefully you're all intact, out there. We've been following the reports on tv in shock and horror. I wish I had better words of comfort for you, but I know what you're going through. I'm right there with you, in spirit. During the worst part of the storm last night, Lulu hunkered down in our room. She fled her boring parents about 1 am when she realized we had no plans to turn the tv off. So now we know we're worse company than howling wind. I knew this day would come. Life with an almost-teenager is certainly rewarding. 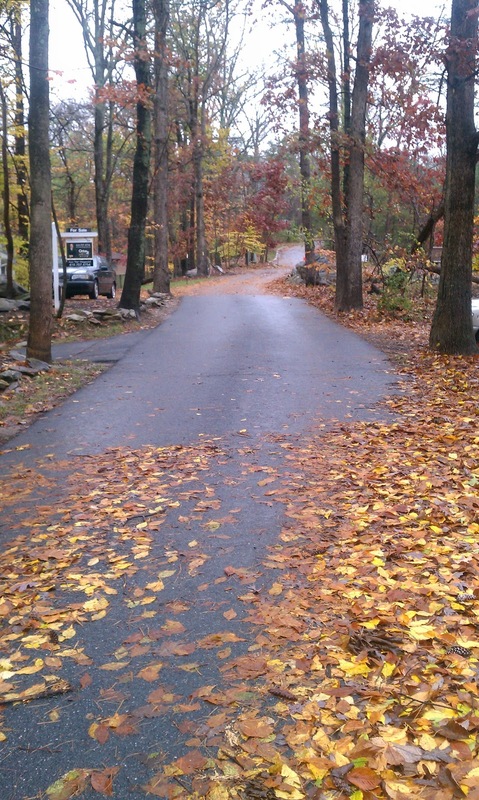 The picture above is from the bottom of my driveway to the lake waaaaaay down below. 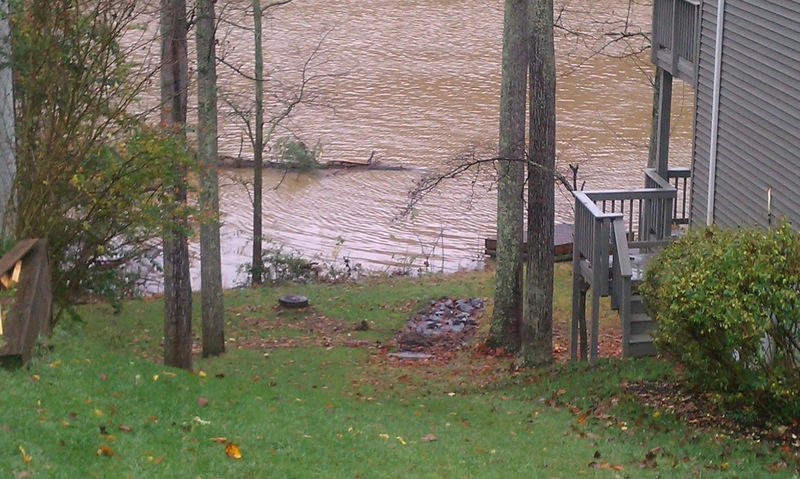 It's hard to tell from this angle, but that floating dock off to the right? It's not floating. 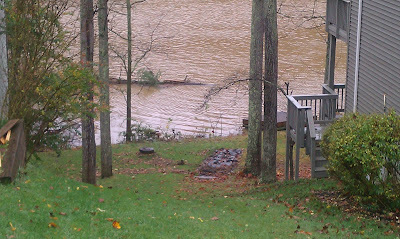 It was marooned up on land when the water crested last night. And that tree in the lake? It wasn't there yesterday. Someone lost a tree somewhere. We found it! Someone's been busy! Even without the for sale sign out front, it isn't hard to guess which house is on the market. It's the one with NO LEAVES ON THE GROUND ANYWHERE INCLUDING THE STREET. We thought this was weird. 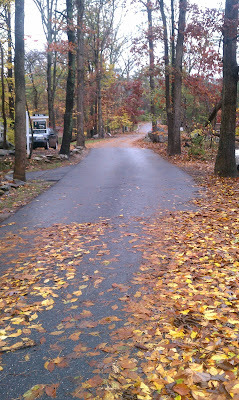 The rest of the street is paved with leaves and branches. And we actually got mail! Sure, it's completely soaked, but it's here! 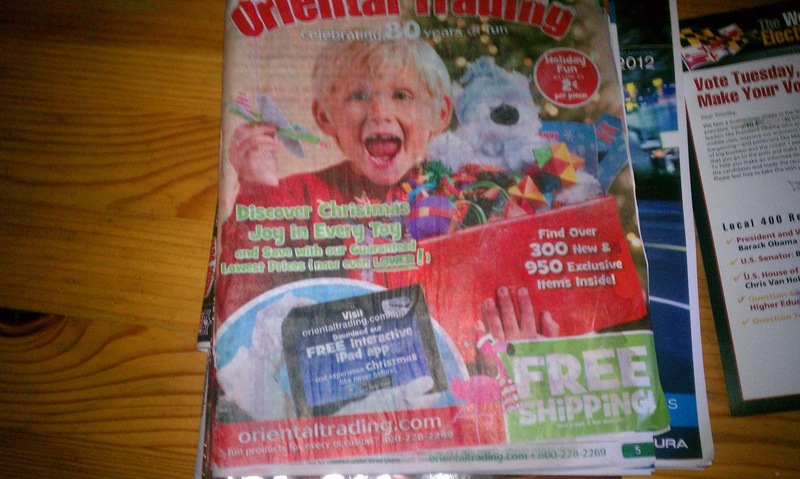 Sorry you're all wrinkly and sodden, Oriental Trading Kid. It's kind of nice to know the USPS still takes that "neither snow, nor rain, nor heat, nor gloom of night" stuff seriously. We're still getting a little drizzle, and the rivers haven't crested yet, so likely there will be more flooding, but the worst is done for us. Nothing has been more helpful than the care and support shown on Twitter. Y'all are amazing people out there. We got off easy here, but it's still good to know everyone else did, too. Not to mention some of the amazing heroic tales I've heard. Thank you, thank you, thank you, to everyone who put themselves in harm's way so the rest of us could stay safe. We owe you all. You're heroes in my book. And I do mean that quite literally. I can't thank any of you enough. Glad things turned out well in your neck of the, uh, woods. I haven't heard of pine beetle issues, but we are overrun with stink bugs. I don't know which is worse. Probably the pine beetles. Stink bugs just stink. It is their only evil superpower.